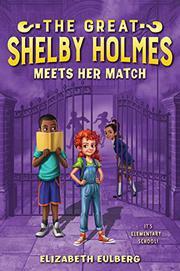 John Watson’s known minisleuth Shelby Holmes for only three weeks, but he already knows sixth grade will be significantly enlivened with Shelby’s cases to solve. John, an Army brat settled down for the first time, makes friends easily in his new Harlem magnet school for the arts. But though he loves his new multiethnic crew—they play video games, shoot hoops, and discuss Mozart sonatas and modern art—he can’t deny the thrill of solving cases. Even when Shelby is patronizing (always!) or rude to their clients (also always! ), John’s excited, but maybe taking a case for their teacher who doesn’t want their help is just a tad over the line. To investigate a villainous private school headmistress, John and Shelby go undercover, Shelby disguised as prim little “Basia Rathbone” in one of several in-jokes for adult readers. John worries about lying to his mother as well as about being a black boy undercover in a rich neighborhood (something that doesn’t occur to Shelby, who’s white), but it doesn’t occur to him to worry about his diabetes. And it doesn’t occur to either of them that anyone could get the better of Shelby, until they meet nasty and brilliant, rich, olive-skinned Moira Hardy.